This Sectional scoop slide is one Heavy Duty straight slide. New design released January 2018, is made with strong rotationally molded polyethylene sections that can be shipped UPS. The slide is about 25in wide. Typical slide has 1 entrance and one exit section and inserting one or more middle sections, it can easily be configured to make slide lengths of about 10ft, 12ft, 14ft, 16ft or longer. Slides for decks heights of over 10ft will need to be put on a hillside or have adequate supports built for it by owner. The approximate length of a typical straight slide is usually about double the deck height to which it will be attached. EX: 7ft deck needs about a 14ft long slide. The Sectional Slide lengths are a bit smaller for a fun slide experience. They have longer exit slow down length for safety. Use of additional bracing (not included) may be needed for slide lengths greater than 16ft long. This new design has strong thicker higher walls. This makes it safer as it is much more resistant for your child to tip-over the sides. The scoop design gives a higher degree of safety than those typical straight slides sold by big box and hardware stores. Who wants to see the slide buckle when a 2 or more 8+ year old kids (~80 lbs each) slide down at the same time? 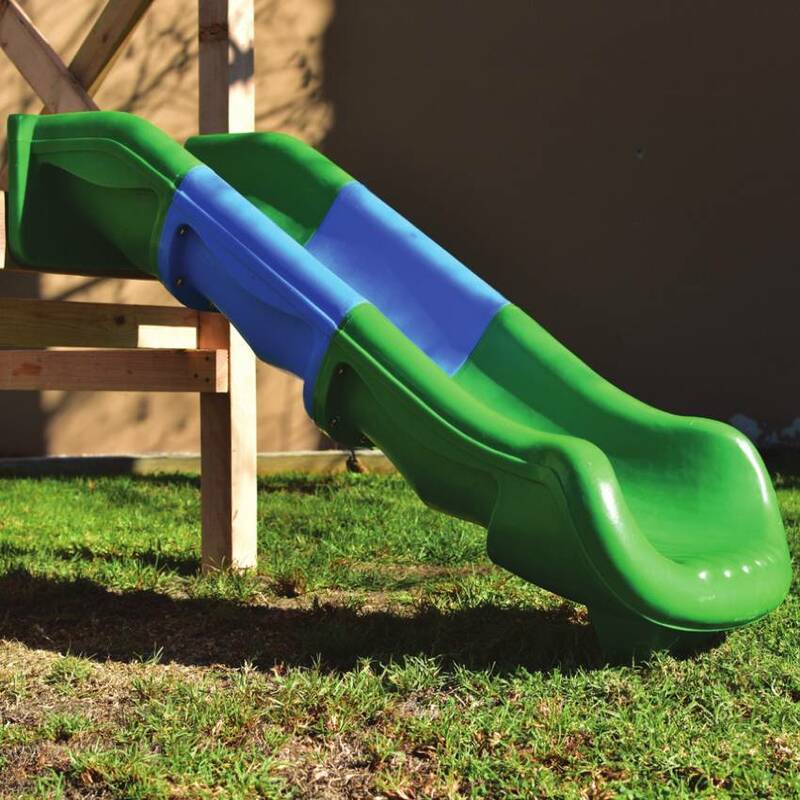 It has a 300lbs recommended weight limit unlike the typical 150lbs limit of other straight slides. ** Approximate horizontal distance the slide will project from where it starts. We recommend a minimum 3ft unencumbered safe zone all around the slide exit. Due to the thermo dynamics and lower heat transfer properties of plastics, plastic slides are preferred over metal slides for playet equipment. Although plastic slides may become as hot as metal, they insulate better and do not transfer the heat as quickly. Because of these properties, the Consumer Product Safety Commission (CPSC) recommends plastic slides and plastic surfaces over bare metal. Regardless of lower heat transfer properties, plastic play equipment can still become hot enough in extreme temperatures and direct sunlight to cause burns. Plastic slides are safe, tried and true, but as is the case with all playground equipment, parents and supervisors must monitor the children in their care, make certain that the equipment is appropriate for their age, and always check playground surfaces for excessive heat before allowing children to play. Reduce the heat by simply using cool water on the slide. These New Sectional Scoop Slides are shipping NOW!!. Newly design in 2018 virtually eliminates seams.